TwinkieMommie: Bink'd Tattoo Earrings Giveaway! 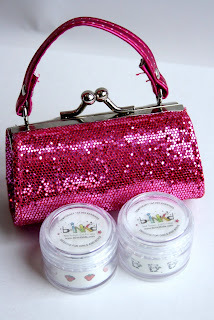 Bink’d is the first of its kind- temporary earrings that do not require magnets, stickers, or glue! Plus, they are more than just “ear fun” as they can be used on nails, face, baby dolls, race cars and more!! Bink’d Temporary Tattoo Earring Designs is unique because they are made in the USA with only kid safe, FDA-approved, vegetable-based inks with collections specifically created and designed to be worn as earrings. The designs are made to fit perfectly on the ear and bink’d has collections for boys and girls. Also, feel assured that you are using the best in that they are compliant with the Consumer Product Safety Standards for kid’s products! Use as traditional earring(s), double, triple piercings or positioned up along the side of the ear. Bink’d has no small parts to choke on and as bink’d says, no holes=more fun because kids (and parents) don’t have to deal with the pain associated with piercing and the risk of infection and/or tearing! Even the packaging is fun. Sold in unique, durable plastic, jar like containers they stack easily so you can collect them all. Each container comes with a strip of 12 designs or 6 pair and a large cotton ball for your first application. Bink’d now has a neat water pen applicator available so you never have to search for another cotton ball! Let your kid’s express themselves…Get bink’d! Not forever. Just for now. One of TwinkieMommie’s readers will win a mini caboodle purse with 2 bink’d original designs of their choice. Design options include: blue star, bunny face, cupcake, lady bug, lightening bolt, monkey face, panda, princess crown, skull, smiling sun, strawberry, red heart, and yellow flower. Even if you don’t win this giveaway, you can still get a great deal! The FIRST 25 TwinkieMommie readers can score a FREE container of bink’d temporary earrings with ANY purchase of Bink’d earrings! Just click here and purchase 1 container which contains a strip of 12 bink’d temporary tattoo earrings (that’s 6 pair) for $5.95 + shipping, write TwinkieMommie in the note’s section, and you will automatically receive a second container of bink’d earrings with your order FREE (please note your design selection in the note to seller section when entering the blog info) (shipping is around $1.40). Mandatory Entry: To enter become a TwinkieMommie follower and please comment below that you are following or already are. Please leave a seperate comment below for each additional entry.